Tanzanians wait before the polls open for their turn to vote in the general election, Kinondoni, Dar es Salaam, Tanzania, Oct. 25, 2015. Tanzanians went to the polls Sunday to elect a new president and parliament in what was expected to be a tight race in the East African country. 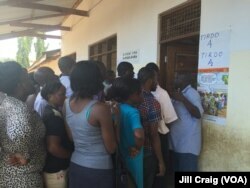 VOA correspondent Jill Craig visited several polling stations in Dar es Salaam Sunday. She reports that voting was peaceful in the capital and appeared to run smoothly, with no incidents of violence or unrest. Tanzanians wait in line to vote in the general election, Mbuyuni, Dar es Salaam, Tanzania, Oct. 25, 2015. Poverty: Many voters say the ruling CCM party has done too little to reduce widespread poverty in the East African nation. Both the CCM and the opposition Chadema party are promising to focus on creating jobs and improving people's lives. Development: Authorities are under pressure to develop offshore natural gas resources that could generate jobs and new revenue. Analysts have said the deposits are big enough to meet Tanzania's needs and export to other countries. Corruption: The government has a reputation for graft that has hurt the CCM's popularity. But Chadema presidential candidate Edward Lowassa resigned as prime minister in 2008 over corruption allegations. Time for change: The CCM has ruled Tanzania for all of the country's 54 years of independence, and some voters think its time for another party to run the country. This is the first time opposition candidates have united behind a single candidate. The longtime ruling CCM party is facing increasing pressure to speed up the country's development and deal with a persistently high poverty rate, but analysts still predict a victory for it. The party was challenged in the polls by a coalition of opposition parties that nominated former prime minister Edward Lowassa as its presidential candidate. The National Electoral Commission of Tanzania said it expects to announce the winner of the presidential vote within three days. Commission chairman Judge Damian Lubuva expressed confidence Sunday that the electoral process will be judged free and fair, despite reported problems at some polling stations in the country. Appearing on a live VOA Swahili broadcast, Judge Lubuva admitted there were some discrepancies at some polling stations, including lack of voting materials, but he said there will be no repeat voting exercises, except in constituents where the process was postponed. More than 140 international poll observer missions were in the country to monitor Sunday's presidential, parliamentary and local elections. 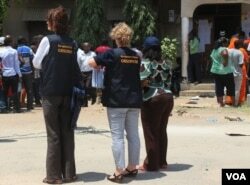 EU observers at a polling station in Dar es Salaam, Tanzania, Sunday, Oct. 25, 2015. According to the World Bank, Tanzania's population between the ages of 14 and 25 almost doubled in 20 years, from 4.4 million in 1990 to 8.1 million in 2010. It is expected to increase to 11 million by 2020 - numbers that should be of great interest to Tanzania’s politicians, regardless of political party. VOA's Swahili service contributed to this report. 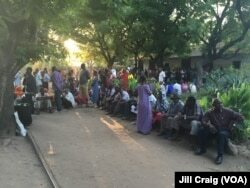 Correspondent Jill Craig contributed to this report from Dar es Salam.